Now that fall is upon us and the pace has quickened, we are enjoying the immediacy of meeting our clients’ third quarter leasing goals. Our success in meeting these goals, quarter after quarter, is fueled by a holistic approach to the legal leasing process, to which we referred last month as systemic thinking. This month, and for the next few months, we’ll delve into the different “systemic thinking” principles and tools we use to move the legal leasing needle closer and closer to peak performance. The first principle of systemic thinking is that there is a common underlying structure that influences behavior and results across similar types of transactions, notwithstanding that the specific circumstances and participants are different. We believe that access to the underlying structure is a powerful way to work smarter, rather than harder, so that desired results can be achieved predictably rather than sporadically. 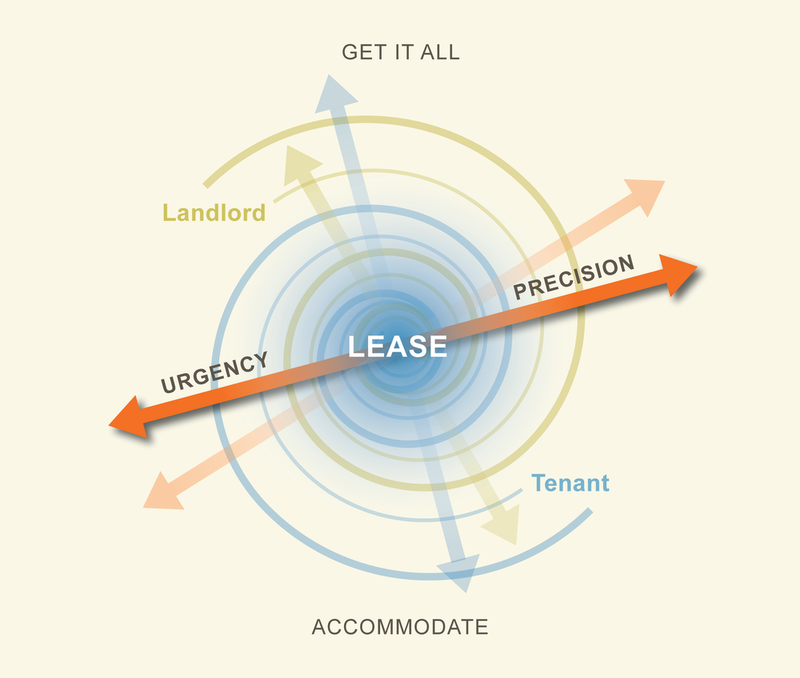 For example, it doesn’t matter whether we are representing the institutional owner of an industrial property in New Jersey or an entrepreneurial retail landlord with one power center in California, over the spectrum of thousands of leases, we are always balancing two separate axes of conflict: precision vs. urgency, and accommodation vs. getting it all. We know that if we let negotiations drift outside the sphere of reasonableness for a complicated entertainment lease in a mixed use building in midtown Manhattan, the transaction will get bogged down the same way it will for a straightforward suburban office lease in Philadelphia. The moments of truth that come up in small leases with “mom and pop” tenants also come up when we negotiate anchor leases with Fortune 500 tenants. Our ability to recognize them and respond in the moment enables us to increase the odds of success time after time. We use this core concept as a tool to partner with our clients. We help them uncover internal operational structures that get in the way of their leasing goals, such as multiple, overlapping layers of consent, inconsistent or inadequate construction, legal and operational back-up, or those pesky dinosaur form leases. The importance of systemic thinking is graphically illustrated by the parable of the blind men and the elephant. Depending on what part of the elephant the blind men feel, it could be a column, a snake or a rug. The same thing goes for the legal process of commercial leasing. Unless you approach the legal leasing process with an understanding of all the parts and parties, and how they fit together over the long and short term, there’s a good chance you'll get it wrong, with costly ramifications. This imperative provides the underpinning for our Black Box strategies that minimize the time, cost and risk of getting leases that withstand the test of time over the finish line. And these strategies apply before, and during, the negotiation process. For example, before we get inside the Black Box, we work with our clients to ensure that the raw ingredients that go into the Black Box, such as the letter of intent and form lease, will facilitate an efficient negotiation, rather than slow it down. Using a form lease that is one-sided and doesn't meaningfully consider the other party’s perspective is not a smart way to expedite negotiations. When we’re in the Black Box, the first order of business is to develop a more particular understanding of the needs, goals and challenges of everyone involved: our client, the other party, the other attorney and the brokers, construction and operations professionals, all of whom we will be working with at different points in the process. During the leasing process, we think a lot about what will happen after the lease is signed. We strive to create a lease that will facilitate a positive, long-term landlord/tenant relationship so that the revenue stream for both the landlord and tenant is protected for the duration of the lease term. This discipline of systemic thinking during lease negotiations means considering issues from all perspectives over the short and long term. Without it, ramifications range from a costly, slow and inefficient negotiation to a derailed lease that never gets signed. In the extreme, a lease might be signed but end up in litigation. One recent example of a signed lease that was the subject of litigation went all the way to the California Supreme Court. The landlord brought suit to challenge the enforceability of a former tenant's remedies. Evidence presented at trial established that the tenant's demand for these remedies was not based on any analysis of what its future damages might be. This failure by the tenant to engage in systemic thinking during the legal leasing process was the basis for the Court’s finding that one of the remedies was an unenforceable penalty. In future posts, we’ll continue to illustrate how systemic thinking during lease negotiations creates value for both landlords and tenants. Your leasing transactions demand the attention of attorneys who won't mistake the elephant for a snake, column or rug. These hazy days of summer are anything but quiet in our corner of the real estate market. As we work on retail, office and industrial leases across the country, we’ve recently navigated treacherous terrain in the Red Zone (that point when the leases are just about, but not quite, ready for signature) that I’d like to share with you. Our Black Box strategies to prevent these potential deal killers from killing the deal (hyper vigilance, communication and teamwork) have saved the day time after time. Although it’s impossible to prepare in advance for any particular Red Zone zinger, you can be prepared. In one recent Red Zone situation, we represented a real estate investment trust, owner of shopping centers throughout the eastern United States, on a lease with a publicly-owned tenant. Throughout the negotiation, the tenant insisted that the landlord take responsibility for how provisions governing the use of existing tenants might be interpreted in years to come. The landlord consistently declined, but agreed to attach the actual provisions for the other tenants as an exhibit to the lease, so there could be no confusion about the actual language. We made sure all open issues were resolved well before the end of the calendar quarter during which the lease had to be signed, including this one, or so we thought. The day before the quarterly deadline, the tenant’s attorney overruled the business rep who had agreed to drop this point. Everyone on the landlord team mobilized, was in communication and on message. At the 11th hour, literally, the tenant did an about-face, gave up on this final point and signed the lease. The moral of the story: sometimes you have to stand your ground and keep pushing to get the lease over the finish line. In a current Red Zone situation, The Sinreich Group represents a prominent real estate owner on a complicated entertainment lease. As the lease moved into the Red Zone, the landlord’s key business person left the company, and the tenant suddenly insisted that a newly formed entity with no net worth, rather than the credit-worthy entity whose financials the landlord had approved, would sign the lease. A different prospective tenant made an offer to lease the premises, leaving the landlord no choice but to simultaneously pursue it. Once again, we put our Red Zone strategies to work: working closely with the landlord’s new business person, negotiations proceeded; a limited guaranty to shore up the shell tenant was agreed to; and after disclosing that there was another interested tenant, simultaneous lease negotiations are moving forward. With two active leases in the Red Zone for the same premises, may the best tenant prevail! We recently attended two real estate conferences: the Urban Land Institute Spring Meeting in Philadelphia, and the International Council of Shopping Centers annual RECON show in Las Vegas. Along with thousands of our real estate colleagues, we shared market intel about getting deals done while the getting remains good. First, get rid of provisions that address every one-off landlord/tenant situation your company has ever encountered. For example, how often is a tenant going to be endangered by hazardous materials emanating from adjacent properties? Does any landlord really expect its tenant to wait an infinite amount of time for delivery of its premises? Is it really necessary to protect against a landlord putting an elevator shaft in the middle of your premises? Second, do away with provisions so one-sided as to be virtually unenforceable. Can either party expect to enforce an indemnity against its own gross negligence? What sense does it make to insist on harsh liquidated damages provisions when actual damages are not anticipated or even considered? In a recent California Supreme Court case, the court struck down a standard penalty in a national retailer's form lease because the harm anticipated during the lease negotiation bore no relationship to the penalty. Third, keep it simple. Although it is tempting for attorneys to elaborate, incorporating every conceivable nuance into every lease provision bogs down negotiations and often creates ambiguity rather than certainty. Is it really necessary to require a landlord to deliver a certificate of occupancy for the premises when landlord's work is complete AND there is written evidence that landlord's construction obligations have passed governmental inspections? I can only imagine the money and time spent by countless landlords and tenants that have labored (and likely will continue to labor) over these and other similarly non-essential provisions in form leases used year after year. As we move with our clients into one of the busiest times of the year, we’ve noticed that the intensity with which we drive ourselves to produce extraordinary results often gets in the way of taking a step back to evaluate whether we’re working smarter, or just harder. 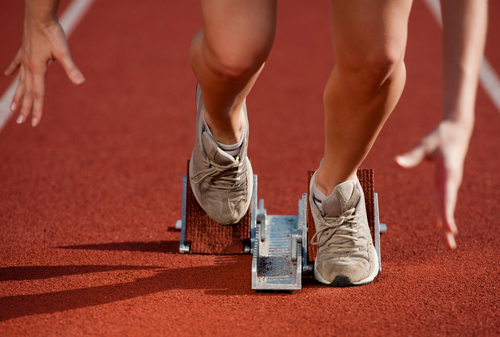 So we thought this would be a good time to share one of our Moments of Truth strategies for working smarter to minimize the time, cost and risk of getting commercial leases over the finish line. Each of the ingredients that go into the Black Box of the legal leasing process: the landlord and tenant teams, the attorneys, the letter of intent and the form lease has a profound impact on the timeliness, costliness and riskiness of the process. While the attorneys and principals are carefully selected and letters of intent are carefully scrutinized before they get into the Black Box, what gets carelessly tossed in is the form lease, which is often a decades-old repository for every leasing issue with which the party generating it ever dealt. Both landlord and tenant suffer as a result. It doesn’t matter whether you’re the 800 pound gorilla who gets to impose its form lease on the transaction (unless the other party signs it without reading it) or the 90 pound weakling on the receiving end. Both parties will spend countless hours and dollars to craft a landlord/tenant framework that reflects the deal to which they agreed. No wonder so many leases take too long, cost too much or get derailed along the way. A recent example of a thoughtlessly used form lease involved a ground lease for the development of a fast food restaurant in the parking lot of a shopping center. The landlord attempted to use a form lease created for leasing existing space to small retail tenants. The tenant responded with its equally inappropriate form lease. We were called in to resolve the battle of the forms, and did so by creating a lease both parties could embrace. In addition to solving this problem on a case by case basis inside the Black Box, we’ve been working with our clients outside the Black Box, so that the threat of a dinosaur form lease is eliminated. To do this, we’ve created a methodology to update and streamline form lease relics into 21st century frameworks for lasting landlord/tenant relationships. It’s an all-hands-on-deck process. Input and buy-in from legal, leasing, operations and construction are essential. When all is said and done, it’s a great way to create value both inside and outside the Black Box. Exuberant is the word I would use to capture the mood on the recent real estate conference circuit that took me from New York to Houston for the Urban Land Institute Spring Meeting and then to Las Vegas for the International Council of Shopping Centers’ annual RECon convention. The reasons for this optimism are straightforward: increased transactional activity, occupancy levels, rental rates and asset valuations. Keeping the inner workings of the black box — the little understood and often dreaded legal process of commercial leasing — top of mind (see our recent Black Box series of blog posts), here are some interesting takeaways from my conversations with some of the thousands of global real estate leaders that attended each conference. Harkening back to our conviction that in negotiating a commercial lease, the urgency mandate must ultimately trump the desire for precision insurance, almost everyone I spoke to at each of the conferences complained about the time it takes to get a lease over the finish line and the painful opportunity costs of long, drawn out legal lease negotiations. The CEO of a publicly traded landlord shared two strategies that his company is resorting to in order to reduce the time it takes to complete lease negotiations. First, they are negotiating multiple leases (with the same tenant) at one time whenever they can. Second, they are short-circuiting the entire lease negotiation by agreeing, almost sight unseen, to accept the last lease a prospective tenant negotiated with a different landlord. The willingness to be flexible (a buzzword for accommodating the other side) on the part of both landlords and tenants came up often in conversations with office, industrial and retail professionals. This reflects two trends that were evident at both conferences. The first is the eagerness to make hay while the sun shines. While practically everyone in the real estate industry is enjoying the uptick in transactional activity, none of us has forgotten the dark days of the recent great recession. The second is that flexibility is being demanded of the actual real estate product itself. To stave off obsolescence, office, retail and industrial properties are evolving to meet the changing needs of tenants/occupants. Examples include former Kmarts that are now urgent care centers and office buildings that are being designed to accommodate coworking spaces, such as those operated by We Work, said to be the fastest growing office tenant in the US. Remembrance of things past, including the busted deals and lost opportunities that result from carelessness in the Red Zone (that point in time when the lease is just about ready to be finalized), has not yielded any improvements in red zone management that were evident at either conference. In fact, I spoke with a national tenant who expressed significant frustration because a key lease transaction was held up in the red zone as a result of the landlord’s inability to locate their ground lease site on the shopping center site plan. I kid you not! The Sinreich Group can help your company get its leasing transactions over the finish line quickly and cost-effectively. Call us today, you can’t afford not to.